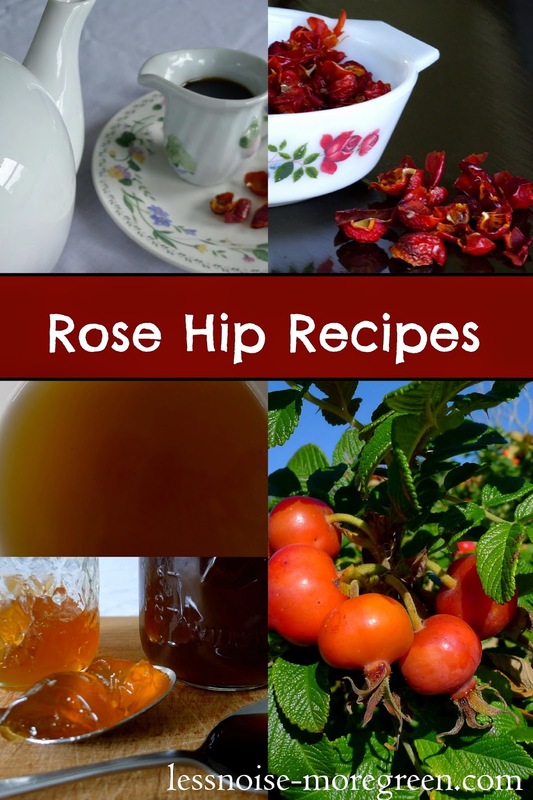 Rose Hips are high in Vitamin C and are used in all kinds of recipes in Europe, including a classic cold Scandinavian soup. In previous years, I have dried the hips and used them for tea. In fact, I wrote a post last year on how to dehydrate rose hips and make Vitamin C drinks. This year I wanted to try making rose hip syrup and jelly. These are great options if you want the health benefits of the hips but don't want the labor of removing all the seeds and hairs! Both recipes call for simply boiling the hips in water, either whole or chopped, and straining the liquid through a jelly bag. The jelly recipe I used came from Simply Recipes and made five and a half pints of jelly, which I canned using the water bath method. The recipe calls for a lot of lemon juice which adds a tang to the beautiful jewel toned jelly. 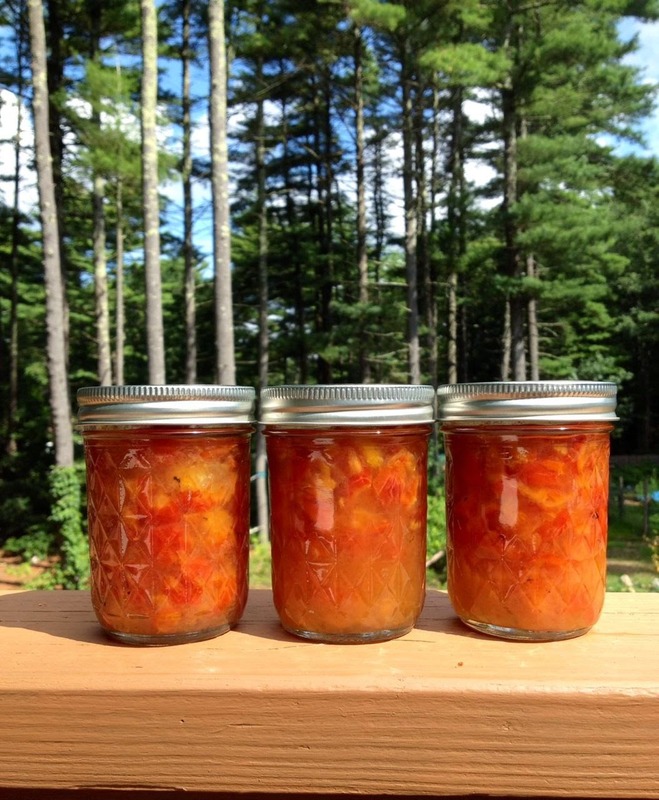 The Rose Hip Syrup recipe I used came from eatweeds. This recipe uses dark brown sugar and the finished syrup looks a lot like maple syrup. Other recipes I've seen use white sugar and the resulting syrup is more rosy in color. I halved the recipe (it made a lot of syrup!) and after following the directions, I found the syrup to be too thin so I put it back in the pan and let it simmer until it was reduced by half, leaving me with about three cups of syrup. The syrup is good, taken a spoonful at a time as a preventative for colds, but I have been adding it to my rose hip tea for an extra boost of vitamin C! It can also be used on pancakes or as a topping for ice cream. A spoonful of Rose Hip Syrup is a great in Rose Hip Tea. Roda decided to make Rose Hip Chutney with her haul. As great minds think alike, she also went to Simply Recipes and adapted their jam recipe to make a more chunky chutney. She has kindly agreed to share it with us. Put the hips, apples and oranges into a large pot and add the lemon juice, zest and water. Bring mixture to a hard boil, partially covered, for 30 minutes or so. Remove from heat. Add the sugar to the rose hip mixture. Heat to high, stirring with a wooden spoon until the sugar has all dissolved. Reduce the heat and cook until the chutney has reached the thickness you want, up to thirty minutes more. Add the two packets of pectin. Bring to a rapid boil for one minute. Ladle into hot sterilized jars and can in a water bath. I love foraging. It feels like finding hidden, tasty, treasure. For trusted water canning instructions, visit Ball's website.